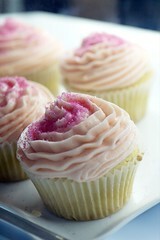 While driving around Paddington for my Camera Craft 2 course I spied a cupcake shop from the corner of my eyes. After the course was finished I dragged T to find it, and lo and behold squished next to Mimco, the display glow like a beacon for the cupcake obsessed. Not sure if this is a new thing or I have been pretty blind in the past few weeks since my cupcake radar is usually quite good. They have some interesting variety like chilli chocolate for one. Though by the time we get there there were only crumbs left so it was kinda difficult to see what else was available. Taste wise? More cakey rather than cup cakey if you know what I mean, the butter is not as impressively buttery as My Little Cupcake, and I ended up liking the Lemon and Poppy Seed one more than the pink vanilla variety though not as pretty. Those cupcakes look gorgeous! Will have to check out that bakery sometime. Hey, we have to go watch that new Goma Miyazaki film some time! How’s the camera course going?